Rolling Stone has called Butch Hancock “a raspy-voiced West Texas mystic with an equal affinity for romantic border balladry and Zen paradox.” Yes, he’s one of those questing Texans with a profound curiosity about nearly everything. His songs may not hold all the answers, but they pose fascinating questions. Butch is as likely to sing about Leonardo da Vinci as he is to sing about a bluebird. What fascinates him most is what songs leave behind, something beyond melody and words. 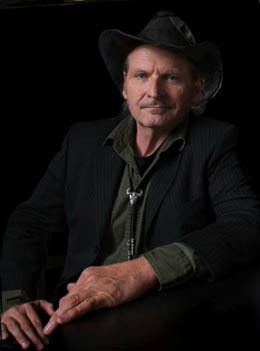 Born and raised in Lubbock, Texas, he formed the Flatlanders in 1972 with a pair of friends he’d met back in seventh grade, Jimmie Dale Gilmore and Joe Ely, and has since recorded 16 solo albums, including West Texas Waltzes and Dust-Blown Tractor Tunes, and six albums with the Flatlanders. Emmylou Harris, Jerry Jeff Walker, and the Texas Tornadoes have recorded his songs. He’s thoughtful, political, skeptical, and insightful, and he has a wry and witty sense of humor. For an evening of great songs sung with grit and heart and a generous helping of hilarious stories along the way, catch Butch Hancock at the Freight.